Sepoy Mutiny (1857) - The British East India Company dates back to 1600 when Queen Elizabeth I issued a charter creating it. It was a venture of private investors who established a trading post in the East Indies which traded various commodities such as cotton, silk, dye, salt, molasses, tea and opium (among other things). Most of the great sea powers of Europe had East India companies. The Netherlands, France and Portugal all had them. In the 17th and 18th centuries, the Dutch East India Company was by far the largest, but it struggled in the late 18th century and went bankrupt in the year 1800. That left the British East India Company as the dominant trader in Asia. Being so far from home, it had to be completely self-sufficient. That means it maintained its own military, coined its own money and dispensed justice (which included executions). 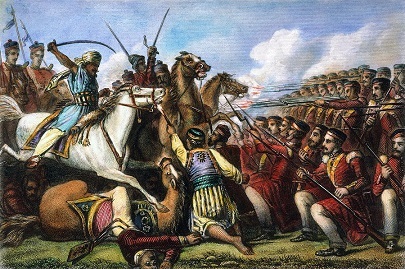 Though present in India as far back as 1612, the British East India Company did not really become big on the subcontinent until 1757 when it defeated the Kingdom of Bengal at the Battle of Plassey. The company began employing Indian soldiers called sepoys. The Sepoy Mutiny of 1857 is seen as the beginning of the Indian independence movement from Great Britain which was finally accomplished in 1947. In fact, in India, the conflict is more commonly known as the First War of Independence. It began on May 10 and lasted just over one year. As a large and diverse region, it's important to note that not all of India joined in the revolt, and several princely states which benefited from British trade sided with the East India Company. Although the Sepoy Mutiny brought an end to the East India Company on the subcontinent, it failed to achieve independence and led to direct rule known as the British Raj. The causes of the rebellion are numerous and complex, and had been building for years before the outbreak of violence. But the straw that broke the camel's back may have been something as seemingly minor as the change of weapons among the sepoys. The British military upgraded to a new rifle known as the Pattern 1853 Enfield (1853 for the year it was introduced). For three years it was used by the sepoys without any problems. But in 1856, word began to spread that the grease used in the cartridges was made from beef and pig fat. In those days, of course, soldiers had to bite into the cartridges before loading them. Because the vast majority of sepoys were either Muslim or Hindu, the Brits managed to outrage both since pork is forbidden by Muslims and cows are considered sacred to Hindus (this could also explain why Sikhs largely did not participate in the rebellion). The frustration finally reached a tipping point in the city of Meerut located in the northern state of Uttar Pradesh on April 24, 1857. Lieutenant Colonel George Carmichael-Smyth, who was not too interested in the sepoys' concerns, ordered his men to perform firing drills. All but five refused to load their rifles. Within weeks, those men were court-martialled for insubordination and sentenced to ten years imprisonment. On their way to prison, they were paraded publicly in chains as a warning to others. The prisoners hurled insults at the other sepoys for not supporting them. But, in fact, they did have support. The following evening the prison guard opened the gate of the jail and dozens of sepoys rushed in and freed their comrades as well as hundreds of other prisoners. About 50 Europeans were killed in the ensuing violence, including some women and children. Some sepoys were conflicted by this turn of events. They actually led British officers and their families to safety before joining the rebellion themselves. Within days, the riots spread to other cities throughout northern and central India. Delhi, which is about 40 miles (64km) south of Meerut, fell to the sepoys and became their stronghold. It quickly became clear that the mutiny was more than the East India Company could handle alone, and the British government, fearing a loss of valuable revenue from India, dispatched troops to help end the uprising. Alliances on both sides were somewhat complex due to the vast diversity of India. The majority of the sepoys were Hindu, but the Muslims amongst them were calling for jihad against Great Britain, which led the British to believe that the Mughal Empire was behind the revolt. The Sikhs remained loyal to the British since they were in the minority and had reasons to dislike both Hindus and Muslims. They assisted the British in recapturing Delhi in September 1857. Once Delhi was captured, it just a matter of ending the smaller rebellions in outlying towns. The main consequences of the Sepoy Mutiny were the end of both the East India Company and the Mughal Empire, and the direct rule of India by Great Britain.